Poland's post-Stalin neon boom is remembered in Warsaw's Neon Museum. After the death of Joseph Stalin in 1953, the Eastern Bloc went through the so-called Khrushchev Thaw that saw a relaxation of social and cultural repression. In Poland, one consequence of this shift was an era of “neonization,” an official policy to bring some of the glitz of Western nightscapes to the streets of Polish cities. The Neon Museum seeks to preserve and display the signs produced under this odd, charming state program. 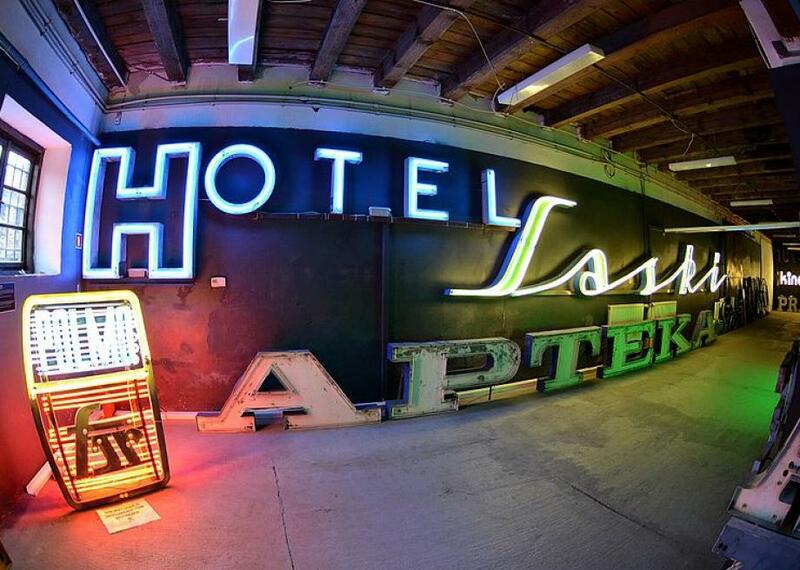 The museum’s collection consists of hundreds of neon signs that were put up throughout Poland from the 1950s to the 1970s. Commissioned and installed by Reklame, the official state advertising agency, the signs were frequently designed to promote cultural and nightlife venues as well as a (theoretically) burgeoning consumer culture. However, since there were no brand names or privately owned shops or businesses, the signs often simply stated what could (again, theoretically) be found at a location (e.g., “Jewelry,” “Sewing Machines,” “Dancing,” “Theater,” etc.) in graceful loops of electric color. The signs were designed by some of Poland’s most prominent artists and graphic designers and frequently featured totally unique, handwritten fonts. There were many nontypographical, purely decorative signs as well, designed to beautify drab facades and animate the night sky. These neon signs became a defining characteristic of Polish city streets and served as landmarks for the people below. As these signs started to disappear in the post–Cold War era, photographer Ilona Karwinska set out to document this unique industrial art form that left an indelible mark on a particular period of Polish urban life. The resulting exhibition, “Polish Neon,” laid the groundwork for the Neon Museum, which Karwinska opened with her partner David Hill in 2012. Contributed by Atlas user burningtree.